What did you think of our last featured halloween prop? At Halloween Alley, we have tons of Halloween props and decorations so that you can make your home scary and festive on our favourite holiday. We’re onto the next prop now, giving you a snippet of the awesomeness you can find at each of our Halloween stores! What could it be? Hanging goblins, ghouls and spooks, of course! Decorating your home for Halloween? Hosting a spooky party? Place this Skeleton Grill in front of your fireplace or these hanging Ghost and Witch props in your doorway to amp up the scare factor on Halloween! 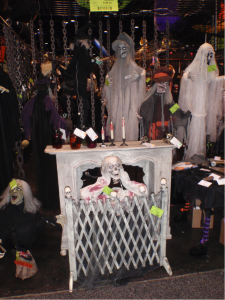 You can see what these props and more look like at any of our Halloween stores – hope to see you soon!